Depending on your previous qualifications, you could opt to study either an Advanced Technical Extended Diploma or Advanced Technical Certificate in Agriculture. For more information on Level 3 Diplomas visit our choosing the right course for you page. You can find out more about each study option using the tabs below. Our established three-year Advanced Technical Extended Diploma is equivalent to three A levels and designed to fully prepare you for a career in the agricultural industry. You will gain industry relevant theoretical knowledge in classroom sessions and practical experience on our farm’s commercial units and at other successful local farms. In your final year you’ll specialise in dairy production, mechanised arable crop production or beef and sheep production. “ I’ve always wanted to work in the livestock industry but my course has opened my eyes to possibilities other than farming. 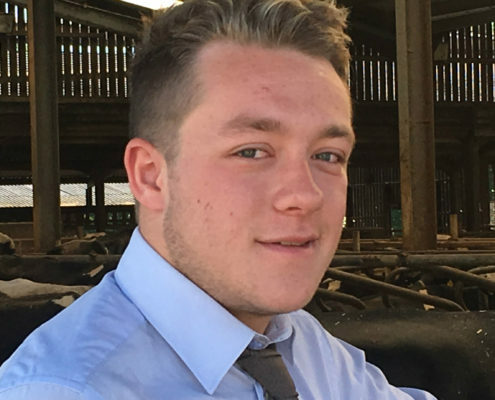 I became interested in the buying and selling side of the industry when I did my year’s placement at beef and sheep finishing units, and I’d now like to become an auctioneer.